Hi friends! I hope you had relaxing holidays and a wonderful start to the new year. I didn't intend to be away from the blog so long, but in truth I needed the break. The time off allowed me to replenish my creative juices and I've come back excited and energized by all the possibilities the new year brings. We took a trip to Hawaii over the holidays and once I go through my 682 photos, I'll tell you all about that. But for now, I'd like to share with you a project we started on just before we left, our next renovation: Project Crafts Department. 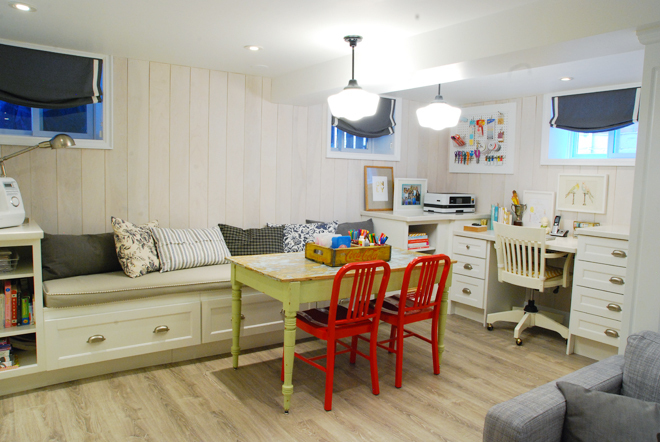 We'll be transforming an empty room in our basement into the craft room of my dreams. I'm calling it the Crafts Department because it'll be used for all sorts of creative outlets: crafting, gift wrapping, sewing, and possibly a place to shoot more DIY videos. My fabric scraps and craft supplies are still sitting in moving boxes (yes, over one year later!) so I'll be glad to have a place in which to finally put them away. The image above captures a bit of what I'm envisioning. 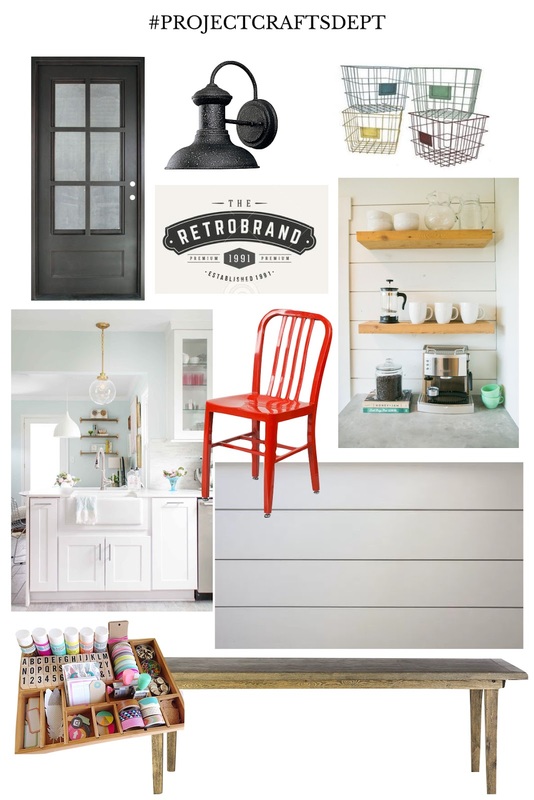 Whenever I approach a new design project, I always begin with how I want the room to feel and for #ProjectCraftsDept the words that come to mind are organized, streamlined, with a touch of vintage. 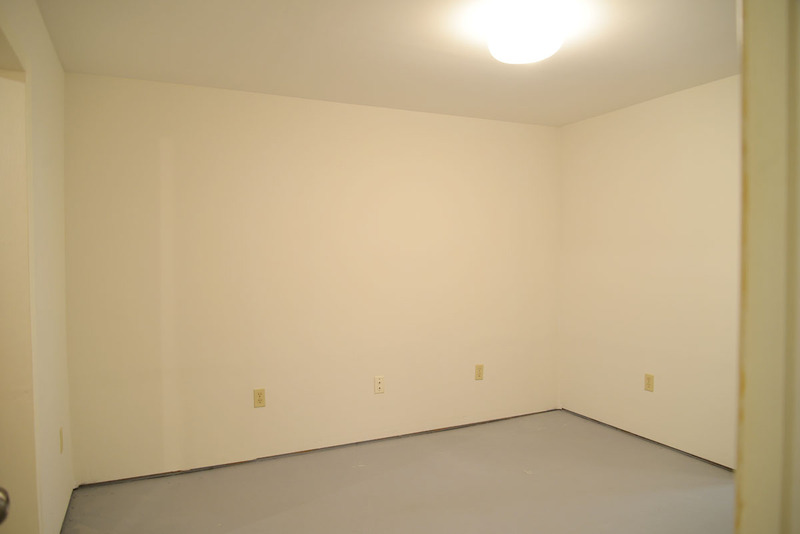 This room is a complete blank slate. It has drywall, a concrete floor and that's it. The room is a good size, around 11'x10', but has three doors. The main entry door (where this photo was taken) is at the bottom of our basement stairs, the door on the left leads to our cold storage, and the door on the right leads to our laundry room. There are no windows in this room and only one light fixture. 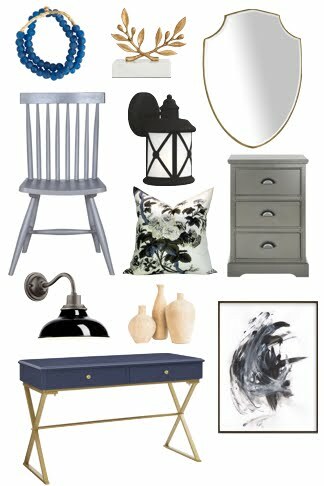 This room needs to be reworked from top to bottom so I'd like to take you on the entire journey, from design concept to layout, to choosing materials, selecting finishes and accessories. 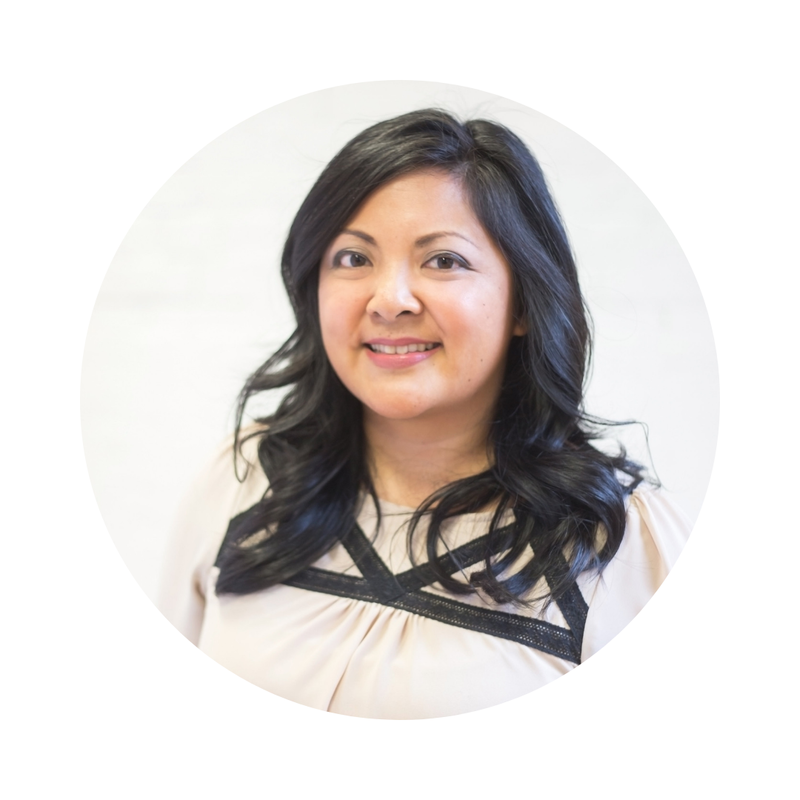 Designing a blank room can be daunting so I hope sharing how we approach it is helpful for your own design projects. As you can see, we are big fans of built-in cabinetry. I honestly feel its one of the best investments you can make for your home. Cabinetry ensures you have no wasted space and if you plan it out correctly, you can customize it perfectly to the way you live. I'm thrilled to be working once again with The Home Depot Canada on #ProjectCraftsDept and we'll using their cabinetry in the space. 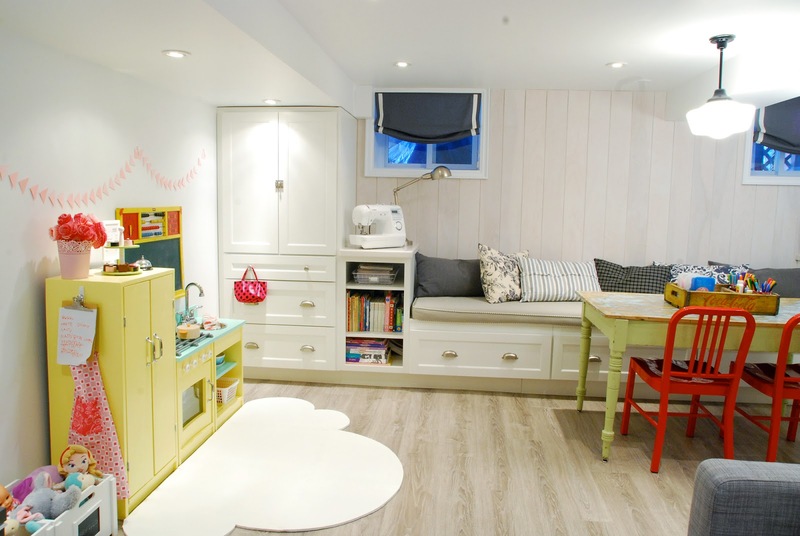 The Home Depot Canada offers a vast selection of cabinetry to suit every style and budget. I'm excited to take you through the process of cabinetry selection, layout and design but first, I thought I'd point out a few things that worked and what didn't work in our last space. 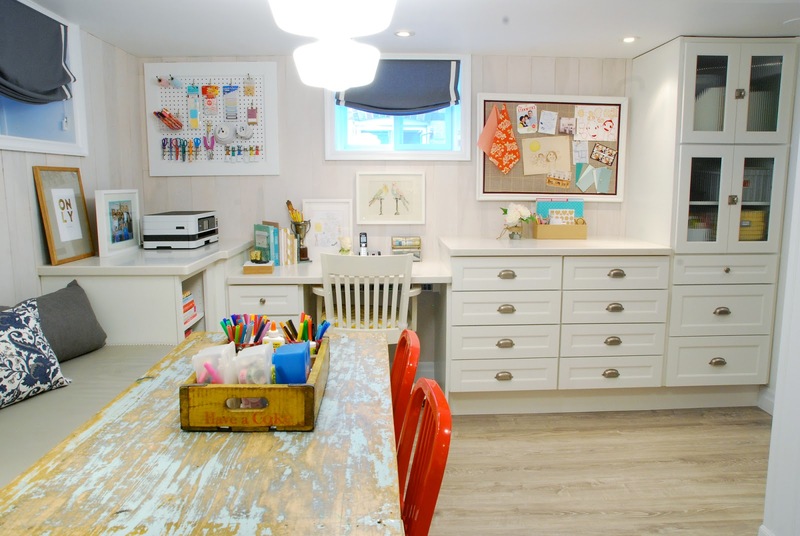 While the quality of the cabinetry was fantastic (the Martha Stewart line from The Home Depot Canada), how it functioned for us as a family could be improved. You might consider these tips when choosing cabinetry for your kitchen, craft, laundry, or storage project. pull-out drawers were preferred vs. cabinets. With drawers, you can see all contents easily, you can lift out items easily, and you don't lose or forget items in the back. the variety of cabinetry sizes allowed us to store many different items. We were also able to create "zones" - toy bins and kid's craft supplies on the left, office and mom's craft supplies on the right. I found I didn't enjoy using the desk space in the basement. The desk area was narrow and I didn't like facing a wall. There's a lot that goes into planning an efficient and stylish space. Next up, I'll share my initial design concepts - and how those quickly changed once we took budget into consideration! Follow #ProjectCraftsDept on social as well as I'll be sharing our progress in the coming weeks. Disclosure: This project has been sponsored by The Home Depot Canada. All opinions and writing, as always, are my own. Thank you for supporting the brands I admire and use in my own home!